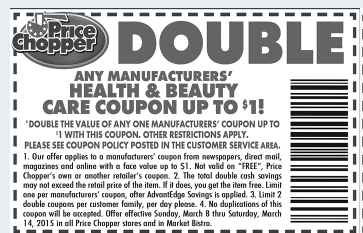 In case you missed the $1 doubler coupons for health and beauty products in today’s Price Chopper newspaper insert, you can click HERE for a printable version. This entry was posted in Capital Region Deals, Coupon, Price Chopper and tagged double coupon, Price Chopper. Bookmark the permalink.